In this St. Patrick's Day, we present postcard US-2399729 to Japan that shows a classic Guinness poster "Lovely Day for a Guinness" produced by S.H. Benson's advertising with art works by artist John Gilroy. Along with other distinctive posters created in the 1930s and 1940s such as "Guinness for Strength", "Guinness Makes You Strong," "My Goodness My Guinness," "Guinness is Good For You", the advertising campaigns contributed to Guinness's success. 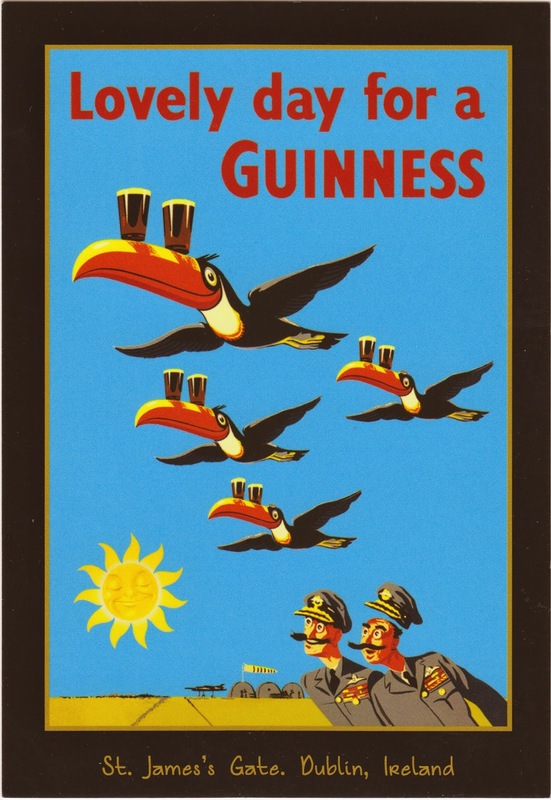 On the card, "the Flight of Toucans delivering the Black Stuff !!" It featured toucans that had become a symbol of Guinness among other animals such as a kangaroo, ostrich, seal, lion. The postcard was purchased at the Guinness Store, located in the Shoppes at Mandalay Place between Mandalay Bay and Luxor Hotel in Las Vegas. It is the first official Guinness store opened in the U.S. and boasts the largest selection of Guinness merchandise in one place outside of Ireland.